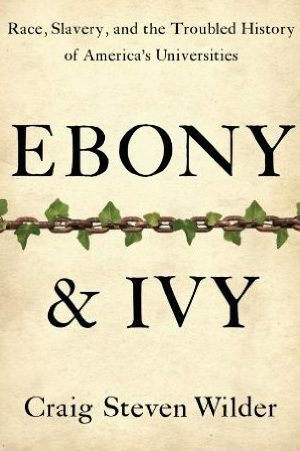 In September 2013, Charles K. Ross, director of African American Studies and professor of history and African American Studies, and Jeff Jackson, associate professor of sociology, met with Joe Ward, chair and professor of history, and Kirsten Dellinger, chair and professor of sociology and anthropology, to discuss the idea of inviting Craig Steven Wilder, author of Ebony and Ivy: Race, Slavery, and the Troubled History of America’s Universities to campus. Frustrated by recent incidents of racism on campus and concerned whether our respective departments might be able to do more to provide opportunities for our students and faculty to engage questions regarding the legacies of racial inequality in our local context, we had just emailed each other an NPR story featuring Wilder on the radio and saw immediately the potential of studying the relationship he explored in our own locale. Ross contacted Wilder about the possibility of visiting our campus in February 2014 and learned that he would be interested and available. The basic idea that emerged from the discussion was to create a faculty reading group, read Wilder’s book collectively, and invite him to campus for a discussion with the group and see where it might lead. We were very encouraged when, upon presenting our idea to Chancellor Dan Jones, he responded with enthusiastic support and a commitment of $20,000 for the reading group. This funding would provide for Wilder’s campus visit, the purchase of the books, as well as a series of luncheons that would allow the reading group to discuss the book prior to Wilder’s visit and discuss the implications of the book for the UM campus following Wilder’s visit. In addition, Jones pressed us to use the remaining funds to explore what other campuses were doing on this issue (Brown University and the University of Virginia, in particular) and to, if possible, develop a set of preliminary initiatives that faculty and students on the campus might be able to tackle with regard to the history of slavery at the University of Mississippi. Dr. Jones also emphasized that these efforts should attempt to connect the realities of antebellum slavery to the legacies slavery in the post-bellum and current contexts. When we sent out the campus wide invitation for faculty to participate in the reading group, we hoped we would get at least 15-20 reading group members to sign on to read the book and attend the series of luncheons during the Spring 2014 semester. We were encouraged and surprised when 58 people from all over campus signed up! This included faculty from seventeen different departments and centers and a number of people from the central administration, including Jones. During the Spring semester, 2014 our “UM Reading Group on Slavery and the University” met three times. The first meeting was to discuss the book and prepare questions for Wilder. During the second meeting, we had the opportunity to meet with Wilder to discuss the book and its broader implications. At the third meeting, we discussed what we had learned as a group and decided to form a “working group” that would continue to explore these issues. The discussions we had within the reading group were engaging and robust. It became clear early in our meeting that we didn’t want to limit our work solely to discussions about enslaved people and their historic significance to the university, but rather we wanted to focus our efforts on addressing bigger and broader contemporary issues of race on campus. In the wake of events across the country in the past year, we felt this was a critical time to examine what is currently happening on campus and become more purposeful and honest about race and diversity. We agreed that faculty often avoid discussions about race because they feel unprepared or are ill-equipped to handle the topic appropriately, and we saw one of our missions to be providing training/support to faculty so they all would be able to facilitate these conversations in constructive and respectful ways. While the nature and content of these numerous discussions are too much to recap here , what became clear is that there was a great deal of energy and interest among reading group members to delve into this topic more fully. In particular, the reading group concluded that there was tremendous potential in exploring the relationship between slavery and our institution and it recommended that we should form a faculty “working group” devoted to investigating and laying out potential plans and initiatives that we might undertake. Of the original 58 members of the reading group, 28 signed up for the working group, which met multiple times in the Fall of 2014 and Spring of 2015 to build upon the reading group’s recommendations. We decided to form subcommittees in three main areas: Research, Teaching, and Community Outreach. Each subgroup was asked to meet independently from the larger group to try to identify the “most fruitful first steps” we might take in each area. Since the formal creation of the UMSRG, we have focused on four areas: building relationships with other colleges and universities who are pursuing similar projects, learning from historians and preservationists, pursuing partnerships with archeologists who specialize in slavery, and, perhaps most importantly, researching the history of slavery and enslaved people on the University of Mississippi’s campus and in the surrounding community. We began reaching out to other institutions committed to studying slavery’s legacy in October 2014, when two group members, Anne Twitty, associate professor of history, and Lynn Deitrich, volunteered to travel on behalf of the UMSRG to the University of Virginia for a national symposium on the topic of Universities Confronting the Legacy of Slavery. Their report back to the group was extremely beneficial in terms of situating our own activities within the larger national context of what other Universities with histories directly connected to slavery were doing. 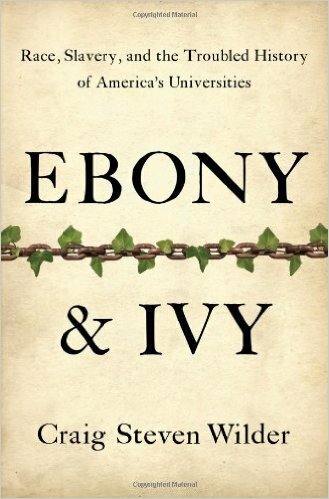 This symposium subsequently launched the Universities Studying Slavery (USS) consortium, which the UMSRG officially joined in 2016. Group members have actively participated in the USS consortium, with Twitty both attending and presenting at the Fall 2016 meeting. 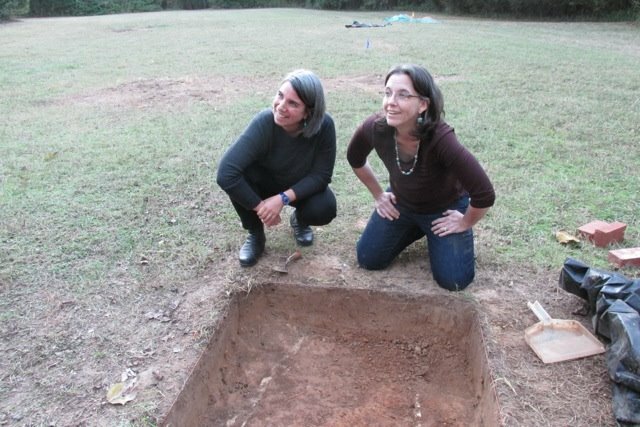 Digital Archeological Archives of Comparative Slavery (DAACS) Project Director Jillian Galle (left) and UM assistant professor of anthropology Maureen Meyers check out an excavation unit outside of the Caroline Barr House at Rowan Oak. In addition to inviting historians and preservationists to campus, we have also pursued relationships with archeologists who specialize in slavery. In particular, we have pursued a partnership with the Digital Archaeological Archive of Comparative Slavery (DAACS), which has created an online, relational database that contains the digitized results from “multiple archaeological sites where enslaved Africans and their descendants once lived and worked.” Their database has focused, to date, on comparative archaeological research in the Cheseapeake, the Carolinas, and the Caribbean areas, but group member Maureen Meyers, assistant professor of anthropology, has spearheaded efforts to find out more about joining DAACS’s efforts and expanding their geographical focus to include deep South sites in Oxford and Lafayette County. Meyers succeeded in bringing DAACS Analysts Elizabeth Bollwerk and Lynsey Bates to campus in December 2015 and DAACS Project Director Jillian Galle to campus in November 2016. Finally, the UMSRG has begun the task of unearthing, both literally and figuratively, how slavery and enslaved people shaped our campus and the greater Oxford-Lafayette County area. In spring 2016 the UMSRG funded two research assistants, Andrew Marion and Chet Bush, both graduate students in the history department. Marion and Bush, who were directed by group members Anne Twitty, associate professor of history, and Paul J. Polgar, assistant professor of history, and aided by group members Jennifer Ford, head of Archives and Special Collections and associate professor, Leigh McWhite, political papers archivist and associate professor, were tasked with examining a wide range of materials in Archives and Special Collections. Their efforts culminated in presentations at the September 2016 Empire, Power, Identity, and Conflict (EPIC) conference at Milsaps College in Jackson, Mississippi. Marion’s presentation, “‘That the Hearts of our Young Men should be Kept in the Right Place’: Pro-Slavery and States’ Rights Rhetoric at the University of Mississippi, 1848-1861,” examined the effects and purpose of pro-slavery and states’ rights rhetoric in speeches and lectures delivered by faculty, administrators, trustees, and politicians from the University’s founding to the Civil War. Meanwhile, Bush’s paper, “Enslaved Lives Recovered: Autonomy and Agency in the Slave Community at the University of Mississippi,” not only uncovered the names of a number of enslaved people who lived and worked on campus, but explored the nature of their labor and attempts to carve out a space for themselves. In addition to Marion and Bush’s efforts, associate professor of history and UMSRG co-chair Jeff Jackson has also recovered a number of original maps, both of campus and the broader community. These maps have not only provided insight into the buildings that may have been used as living space for slaves and servants from the 1850s to the 1890s, but also the location and extent of various plantations in Lafayette County. These efforts, of course, are only the beginning, and we look forward to sharing our findings with you as our work continues.